Butternut squash tends to wear out its already-tenuous welcome in our home about this time of year. Our Root Cellar winter CSA has been humming along for a couple of months and the squash tend to be among the less-popular inclusions. This, of course, makes me sad. Because where the kids and Mrs. SMEs see pablum I see possibility: stir-fries, gratins, even salads. But always, there’s soup. 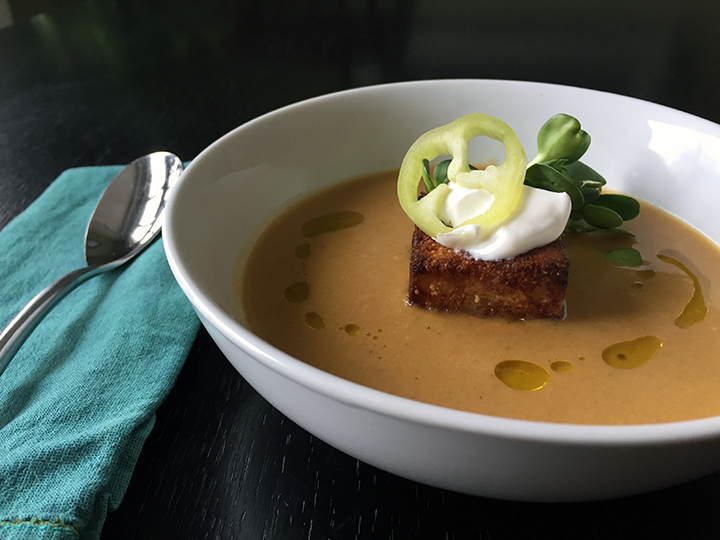 I’ve spent years trying out butternut squash soup recipes on the family, but rarely have ears perked up and taste buds been surprised. Well, good news, friends: I have finally cracked the code. Banished are the butternut soup blahs, replaced by raised eyebrows and empty bowls. In a large pot, heat the bacon fat and sauté the onions and garlic until soft. Add ground ginger and cumin and stir, lightly toasting the spices for a minute or two. Add squash, potato and apple, stir, and add stock. Bring to a boil and then simmer, covered, until squash is very easily pierced by a fork – approximately 20 minutes. Remove from heat and take your kid to soccer practice, make that cornbread or call your mom. It’ll be here when you get back. About 30 minutes before you want to eat dinner pour the soup into a blender and blend until very smooth. Return soup to the pot, add cream and heat through. If you like thinner soup add a little more broth; for thicker, simmer uncovered for a few minutes. And always, taste and add salt and pepper to your liking. The resulting soup should be at once earthy and bright, with a little tug of war between sweet and spicy in the background. * Email me if you’d like to try any of the sprouts we grow during the winter – sunflower, radish, pea and more. * Stocks from the Columbia Area Career Center are the way to go. Trust me.